Life as a Wounded Warrior Family is filled with ups, and downs, lots of not knowing what is going to come next. It’s unpredictable, unstable, and most of the time getting through one day without an issue is something to be celebrated! There have been so many times when I wished just for a second that we could just be a little bit normal, to not have to worry about where we are going to live, or what we are going to do. May 11, 2011, in front of half of Florida, these wishes came true for me, and my family when Military Warrior Support Foundation presented us the keys to a 100% Mortgage Free home. It was incredible, my husband and I were told that we were there to support another family who was getting a home, and to enjoy a FREE Darius Rucker concert, I was sure at that point I was in heaven. There is just something about an outdoor concert that just really makes me happy, and who doesn’t LOVE Darius Rucker? Well, the joke was on us. The other family who was there was handed their key, and I was fumbling around in my purse to find a Kleenex to offer the crying mother of the Marine who just received home when they told my husband that they had one for him too! Once I finally realized what was going on, I almost fell out of my chair. Nothing like seeing your self-crying like a baby on national TV later that evening! We got the keys, and began to move in on September 16th was our move in day! We were so excited we had a slumber party on the floor that night! Our home is more beautiful than anything we could have ever imagined, I joke that they had us wire tapped because pretty much everything we could ever want is in this house! I know you are thinking, yeah right, that sounds unrealistic, but it isn’t, I’m living breathing proof! I was a bit skeptical myself to be completely honest. I didn’t even start packing to move until the day before. Okay, so maybe it wasn’t THAT bad, but I certainly never dreamed that something like this could happen to us! 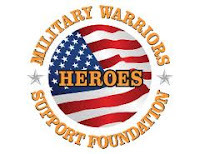 It doesn’t stop there; Military Warrior Support Foundation really goes above and beyond to ensure that this is a positive experience for everyone by providing 3 years of financial, and family mentorship. They don’t just hand you the keys and leave you hanging, they set you up for a lifetime of success. This is life changing for my family. With a husband who is 100% disabled suffering from PTSD, TBI, COPD, and a laundry list of other things, I don’t really know if he will ever be able to hold a job again. As much as I would love to see him succeed, I’m just not sure, and this ensures we will have a roof over our head, and plenty of exercise for me mopping all these floors! I am sure by now you are wondering what you have to do to be eligible. First, you must be a Combat Wounded Veteran of Iraq, or Afghanistan. Purple Heart Recipient Strongly Preferred.) Next, you must be retired. Those with compelling situations, and are less than 30 days from retirement may be considered. Finally, you must not currently have a mortgage. Do you meet the criteria? Hop on over to Militarywarriors.org, and apply, you never know unless you try!